In this blog post I’m going to try something a bit unusual and think critically about my own work. 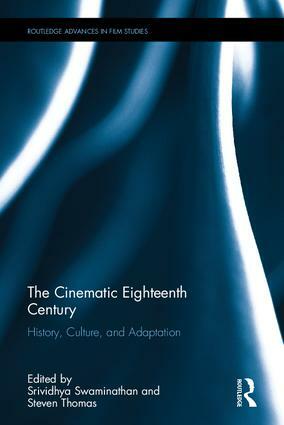 A few months ago, my colleague Srividhya Swaminathan and I published a collection of essays that we co-edited together entitled The Cinematic Eighteenth Century: History, Culture, and Adaptation for Routledge. The book includes eleven essays on various topics including one by my co-editor and one by me. Some of the ideas for my essay, “Cinematic Slavery and the Romance of Belle” were actually first expressed in this blog — in the three reviews I did of the movies Lincoln, 12 Years a Slave. and Belle. After writing those reviews and after receiving some positive feedback from colleagues, I was inspired to go do more thorough research on the topic, audit a class on African Cinema at NYU, and teach an undergraduate class on it… and voilà. Here’s what I think our book does that’s groundbreaking. We put together some terrific essays by brilliant scholars, and one could read each one individually, but I think reading them all together is the real pay-off, because then you get a sense of the rich diversity of the eighteenth century and how different issues connect. As the chapter by Jodi L Wyett aptly demonstrates, adaptations of Jane Austen novels such as Sense and Sensibility are remarkably varied in how they represent gender relations. But I think we might also think about gender and feminist ideas in terms of other issues such as piracy or slavery or the Declaration of Independence. Of course, Jane Austen would have been aware of all those other issues also, so our hope is that after reading our book one will take away richer sense of the interconnections among these different subjects and a fuller appreciation for real potential of the eighteenth century for film and for popular culture today. An essay by Ula Lukszo Klein tackle subjects such as homosexuality in movies such as The Duchess; essays by Dorothée Polanz and Elizabeth Kraft give a historical view of the centuries of commodification of the celebrity figures Marie Antoinette and Charles II; and Jennifer Preston Wilson analyzes how the camera techniques depict the mental illness and treatment of King George III. My own essay looks at the movie Belle, which is a film that takes the plot structure and setting of a Jane Austen novel, inserts a bi-racial heroine, and brilliantly uses that form to narrate complicated debates about the insurance industry’s relationship to slavery. Other essays in the book do interesting things with genre. In a lot of scholarship, adaptations of novels to the screen are analyzed in one place while historical period dramas are analyzed in another place. But although scholars may categorize movies this way, I don’t think people who go to theaters always think like that. My colleague Srividhya Swaminathan’s essay on pirates theorizes the concept of the “transcoded mosaic” to show how the new TV shows Crossbones and Black Sails actually mix and mash together a little adaptation here, a little historical fiction there, with a lot of inventive storytelling to add more diversity to the characters. The chapter by Kyle Pivetti looks at how a sci-fi movie The Martian adapts Robinson Crusoe to twenty-first century economic ideologies; the chapter by Courtney Hoffman analyzes how the TV show Outlander uses time travel to prompt critical reflection on women’s history. Likewise, National Treasure uses the detective thriller form to portray the history of the Declaration of Independence (in highly inaccurate and politically misguided ways, of course, as the essay by Colin Ramsey in our collection explains.) And of course, lest we only think of the eighteenth century as something a bit stodgy or serious, another essay by Sarah Stein and Robert Vork shows how the TV satire Blackadder mocks the whole enterprise of making films about the eighteenth century. Point being, the different essays in our book speak to each other. Nevertheless, since our book has been published, I’ve been thinking more about some of the issues we raise, including what the eighteenth century signifies globally in world cinema and what sorts of genres of film encode the different time periods. For example, the “pirate movie” is usually about the time period roughly 1680 to 1730 (the so-called “golden age of piracy”) while the “western” is usually about the 1860s to 1890s, and kung-fu movies are seen as having a different geography and temporality altogether. But let’s take the movie Sense and Sensibility directed by Ang Lee in 1995. This movie is usually talked about in relation to other Jane Austen adaptations. But Ang Lee’s other most famous film is a kung-fu movie (a.k.a., the Wuxia genre), Couching Tiger, Hidden Dragon (produced in 2000) one of the most successful kung-fu movies of the twenty-first century and famous for encouraging more international collaborations in an increasingly global movie industry. We might note that the setting for Sense and Sensibility is England in the 1790s, and the setting for Crouching Tiger, Hidden Dragon is China in 1778 — remarkably the historical moments are just a few years apart from each other, but in terms of geography and genre, they seem worlds apart. And yet, Ang Lee’s two films are not so different from each other. Both movies foreground friendship and equality against cultural expectations of marriage and class distinction. What might it do for us to reconsider a Jane Austen adaptation in relation to other film genres and other contexts? Pride and Prejudice and Zombies was a popular hit, but we might think more globally, as one of the contributors to our collection Dorothée Polanz remarked during an eighteenth-century studies conference in Toronto this past October that a lot of Japanese manga appropriate literary and historical figures from eighteenth-century Europe for their stories. I think there’s a lot more to say about genre in a global context than we did in our book, so I’m hoping some new scholars will come along and pick up where we left off. The thing about genre is that it always must fulfill the audience’s expectations in some way, but the formula is not actually so rigid as one might think. Truly, the delight for the audience is in the innovation — how a movie, TV show, comic book, video game, or YouTube sketch might play with those expectations and perhaps uses the conventions of one genre to shed light upon another. I’m curious what other examples people might know of such genre-mixing that pertains to an international eighteenth century. Please feel free to comment on this blog post to share some examples and your thoughts about them.